Come up to a new point of view. 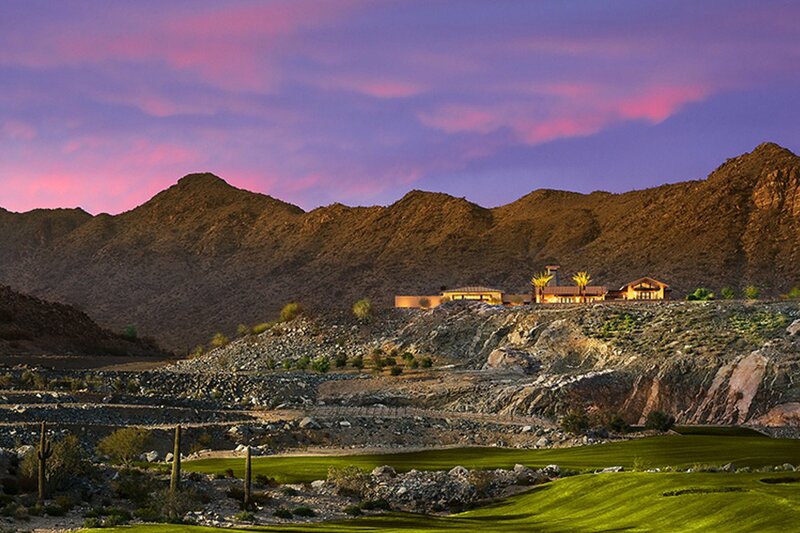 Sitting nearly 1900 feet above the desert floor is the prestigious Victory Club, an inspiring resort-style destination boasting unprecedented valley views, private pools and fitness, its very own spa, a hillside vineyard and The Vic Bar + Kitchen – the renowned restaurant critics can’t stop raving about. Sunrise over Four Peaks with a latte. Meeting up with hikers heading out for a trek up Victory Peak. A leisurely lunch with neighbors at the resort-style pools. Perhaps a relaxing deep-tissue massage at The Spa at Victory Club or a nap under a shady mesquite canopy. Evening cocktails at The Vic Bar + Kitchen with stories, laughs, and yet another painterly Arizona sunset. Every day you’ll find new friends and new experiences. Victory Vineyard. Yes, the Victory Vineyard. Victory has its very own 3-acre hillside vineyard, and on the vine are a curated blend of pinot grigio and zinfandel grapes. Situated on a stunning granite overlook in the center of the Vineyard is an al fresco farm table that has become a favorite sunset gathering spot for neighbors and friends. The Vineyard will eventually supply the community with its own private selection vinegar and signature wine. In the meantime, it serves as the inspiration for our annual grape stomping Crush party. The Vic Bar + Kitchen. Destined to become your new favorite hangout, everything at The Vic is delicious and prepared from scratch in the open exhibition kitchen. An innovative, chef driven menu offers classic comfort food with a deliciously modern perspective. 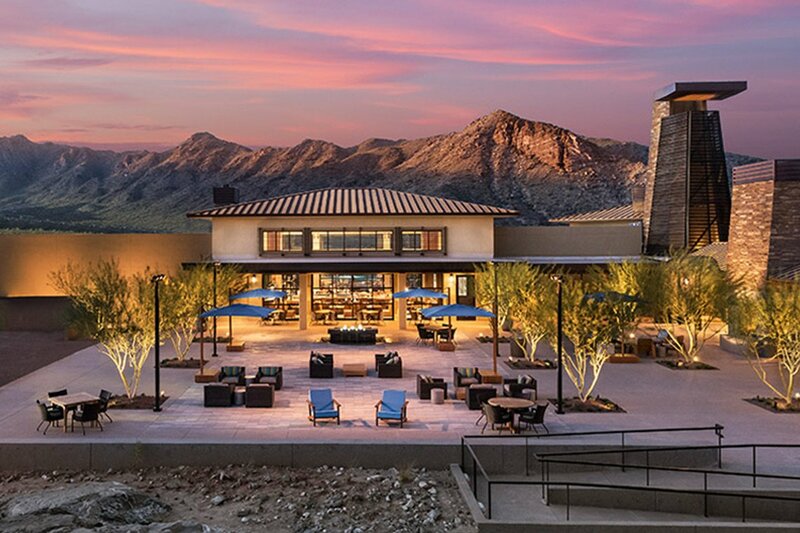 Enjoy a signature cocktail while you drink in the breathtaking vistas that stretch from the downtown Phoenix skyline to the Four Peaks mountains. Visit The Vic Bar + Kitchen. Life Performance Training Center. A bold achievement in architecture and space design, this Applied Functional Science and cardio studio features nearly 7,000 square feet of modern training equipment and natural light. This is no ordinary gym. The Life Performance Training Center is a modern tribute to helping you physically accomplish whatever it is you want to do. With its stunning views of the White Tank Mountains and pool areas, you’ll find yourself looking forward to the next workout. Movement Studio and Yoga Lawn. Open and inviting spaces designed for group classes and activities, both inside and out. Practicing yoga with the White Tank Mountains as the backdrop? Now that’s a Zen moment. Outdoor Lap Swimming Pool. Twenty-five yards and five wide lanes for every stroke. Pro-designed gutter systems keep waves to a minimum for blissful lap swimming. Racquet Sports Pavilion. We’re serving up plenty of pickleball and tennis courts for pickup games or round-robin tourneys. Resort-Style Pools. Three sparkling terraced pools designed for lounging, light activity or therapy. 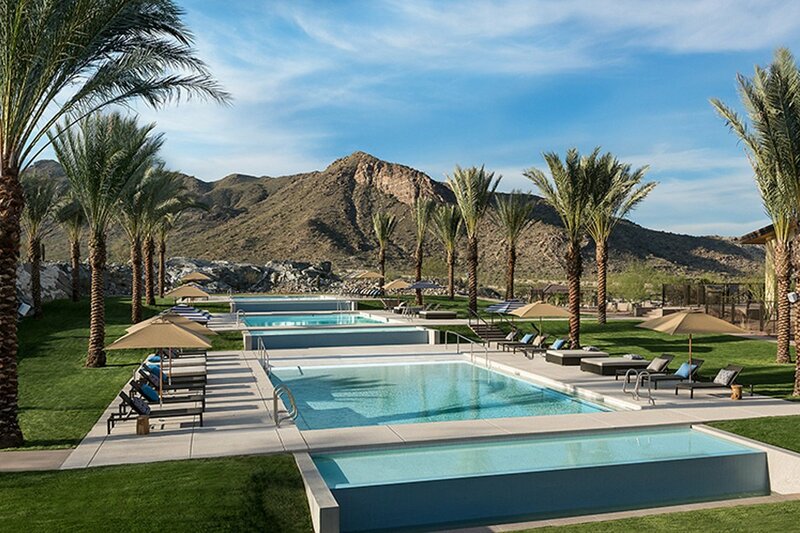 At the top of the pools, you’ll find a secluded fire pit for that perfect spot to end the day. The Spa. While we all love to be pampered now and again, our approach here is a bit different. We believe living well isn’t a luxury—it’s a necessity. To us, the ideal spa experience is about looking and feeling your best every single day. So we’ve created The Spa to be affordable and accessible for the “whole you,” with added emphasis on nutrition and fitness. But rest assured, if you just want to be pampered, we’ve got that covered too. Visit The Spa at Victory Club. Men’s and Ladies’ Locker Rooms. Beautiful respites that can take you can from your workout or spa treatment to dinner and drinks with friends. Featuring complimentary hair and skin products. Victory Central & Arizona Great Room. Victory Central is aptly named. Start here for an always current schedule of events, classes, happenings, news, and virtually anything else we can provide for your perfect Victory Club experience. Here you’ll also find our grand Arizona Room. If a room ever welcomed you with wide open arms, it would be this one. The soaring ceilings and expansive stretches of glass are both impressive and inviting. A great place to relax, read a book, or meet up with friends. Arts With a View. The crown jewel of the campus, with spectacular views overlooking Phoenix. This delightful space is a magnet of culture featuring a professional grade art and craft studio. A gorgeous deck overlooks the Valley with ample space for easels under the sun, or wine tasting under the stars. Event Lawn. The beautiful grassy expanse is a great place for patrons of The Vic Bar + Kitchen to have a drink while they wait for their table. The space also plays host to outdoor concerts and events for Victory residents. Sports Den. Part sports book. Part pool hall. Part comfy lounge. And all fun. The place to catch a football game, hone your eight-ball, or sip a smokey single malt. Adjoining outdoor patios make this a perfect hang-out day or night. Victory Hall. Featuring an exciting and varied curriculum of classes, seminars, and workshops available for every Victory resident.